Our version of the classic legging. Made of 90% cotton, 10%lycra, these are truly comfortable enough to wear all day. Machine wash, tumble or hang to dry. We call these the "hip-huggers". The low-rise leggings are cut a bit shorter in the rise. These are great for class - no more rolled waistbands bunching up under your hip scarf! Just like our classic leggings, only shorter! These work really well under sheer skirts to give that "extra coverage"! This version of the bell bottom jazz pants is HOT HOT HOT! A super popular style! These lucious slinky pants flair at the bottom in a wide bell and are split to the knee on one side to give lots of fabulous flounce and flash. Guarenteed to make you look great and give your dance more "bounce for the ounce". These pants are made from an acetate/spandex blend, lightweight and stretchy. These are designed to hug your curves in all the right places. Currently available in our always popular black, as well as leopard, tiger, royal blue and santgria. 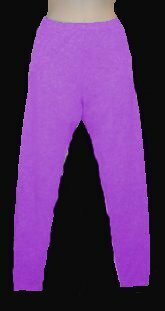 You can also have these same great pants done in any of our cotton lycra colors.